For those seeking answers to technical queries, Google just upped its search game. Now for queries containing sequences of 2-3 special characters such as [== vs ===] and [+=], Google will return results on the meaning of these sequences in programming languages. For example, if you’re searching for the meaning of [c++17], you will get results for the well-known programming language instead of c17, which brings up a Boeing airplane. Additionally, organization and product names that include punctuation, such as She++ and Notepad++, will return more accurate results. 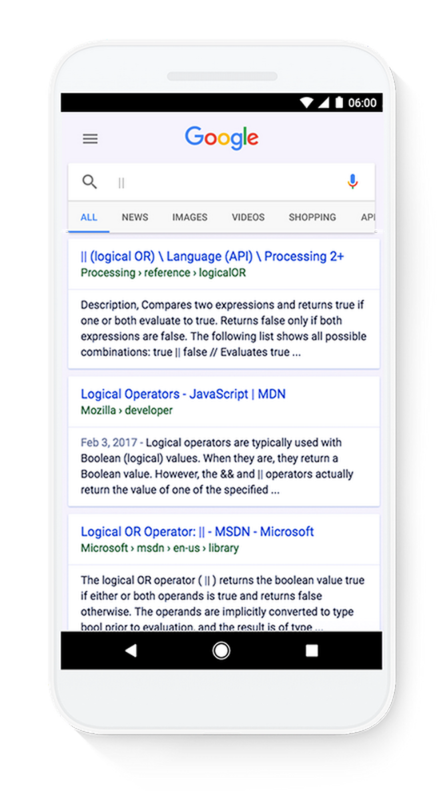 Whether you’re a student looking to learn the basics of computer science or an engineer at a tech company, Google is now an even better resource to find information about various programming languages. We’ll continue to improve the experience over time for our fellow programmers and tech lovers out there because after all, we’re techies, too!